A 13-day classic drive across southern British Columbia from Vancouver to Calgary featuring the lake and mountain resorts of Harrison Hot Springs, Lake Okanagan, Osoyoos, Nelson, Fernie and Waterton Lakes showcasing fine wines and wilderness activities. Enjoy two nights accommodation at each location along with a wide range of adventures and activities, which turn this vacation into a true adventure. Activities included in this itinerary are a First Nations Cultural Cruise, horseback riding, a winery tour, helicopter tour or ATV tour, private guided fly fishing. What better way to vacation than with the flexibility and freedom of exploring with a rental vehicle. Arrive in Vancouver and collect your rental vehicle for your journey to Harrison Hot Springs. A visit to Minter Gardens en route is recommended. 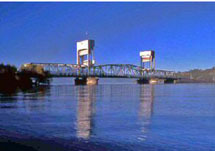 Journey time to Harrison Hot Springs is approximately two hours without stops along Highway 1. If you are arriving from an international flight or in the late evening we suggest you overnight in Vancouver prior to commencing your journey. Bordering on the breathtaking snow-capped mountains of Southwestern British Columbia, Harrison Hot Springs is a refreshing world of outdoor tranquility. Once a stopover on the legendary gold rush trails, this beautiful wooded shoreline has become a renowned Canadian getaway. Relax and unwind at the Harrison Hot Springs Resort & Spa where you can indulge for the next two nights. Overnight at the Harrison Hot Springs Resort & Spa. Included in your stay is a First Nations Cultural Cruise along the alluring southern Harrison Lake and upper reaches of Harrison River. View ancient rock paintings (pictographs) and rock carvings (petroglyphs), archaeological sites, traditional lands and ‘Transformer’ sites, which are rock formations that resemble human or animal forms and are key elements of many First Nations legends. Your guide will share stories of the Sasquatch, legends, drumming and singing throughout your two-hour tour. Overnight at the Harrison Hot Springs Resort & Spa. Journey towards Hope and follow Highway 5, the Coquihalla, to Merritt before turning onto Highway 97C towards Kelowna. Allow for approximately four hours of driving time. Lake Okanagan gained some if its celebrity through the water monster named Ogopogo rumored to live in its waters, but with no hard evidence the search continues for the Lock Ness look-a-like. Arrive and check-in at the Lake Okanagan Resort, situated on over 300 acres of mountainside parkland along the shores of Okanagan Lake, where you will have beautiful views of the lake to search for this elusive sea creature. Overnight at the Lake Okanagan Resort. Included in your stay is an activity pass which will provide you with a horseback ride and gain you access to the trampoline waterpark, hiking trails, fitness centre and swimming pools. Overnight at the Lake Okanagan Resort. Follow Highway 97 south for your two and a half-hour journey into Osoyoos, an oasis in the desert. 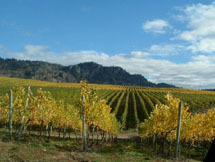 Osoyoos is the only desert in Canada and has the most temperate climate in the country. What better accompanies dry warm weather than a lake – Osoyoos Lake is the warmest fresh water lake in Canada and is known for its water sports and holiday atmosphere. Arrive at your leisure and check-in for your two nights stay at the Spirit Ridge Vineyard Resort and Spa where you will be welcomed on arrival with a basket of seasonal Okanagan fruit in your room. Overnight at the Spirit Ridge Vineyard Resort & Spa. Included in your stay is a six-hour winery tour highlighting some of the finest wines in this region. Spend the afternoon sipping, savouring, dining and learning about what makes a good wine. The remainder of the day is at your leisure. Overnight at the Spirit Ridge Vineyard Resort & Spa. Travel close to the US border today on a three and a half-hour drive following Highways 3 and 3A east into the Kootneys and on to the regional capital, Nelson. Nelson is a place where life is unhurried and people say "hello" to strangers. Relax and enjoy the leisurely pace. Check-in to your two-night stay at the Prestige Lakeside Resort and prepare yourself for some adventure. Overnight at Prestige Lakeside Resort. 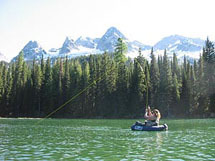 Today you will have a choice between a 30-minute Kokanee Glacier Helicopter Sightseeing Tour or a four-hour ATV journey of Six Mile Lakes with lunch included. No matter which you decide on, be sure to bring a camera to capture some of the amazing views. Overnight at Prestige Lakeside Resort. Your route today takes you past Stagleap Provincial Park, through Creston and Cranbrook and deep into the mountains at Fernie. Please allow four hours of driving time for the journey. Located in the Elk Valley, Fernie is a paradise for the outdoor enthusiast. A plethora of options await for fun in the sun. Arrive at your leisure and check-in for your two-night stay at the Lizard Creek Lodge. Distinguished by its private setting in the Highline Estates Subdivision, Lizard Creek Lodge is just a few metres from the Elk Quad Chair Lift at the Fernie Alpine Resort, which offers great access to the alpine. Overnight at Lizard Creek Lodge. Today enjoy a private guided river float fly-fishing trip with one guide per two fishermen. Pick up pointers during the fly-fishing introduction and get suited up before heading out to the river. Overnight at Lizard Creek Lodge. A rare gem tucked into the southwestern corner of the province of Alberta is Waterton Lakes National Park, a two and a half-hour journey from Fernie. In this breathtaking part of the world, the majestic Rocky Mountains rise suddenly out of the rolling prairies. Amid the peaks are the lakes of Waterton Lakes National Park, carved out of the rock by ancient glaciers. Enjoy your two-night stay at Waterton Lakes Lodge. This country inn features a recreation centre, indoor saltwater swimming pool and whirlpool hot tub. Overnight at Waterton Lakes Lodge. This morning your four-hour Cowboy Cookout Ride will begin from the Nelson Ranch where a horse will be matched with your riding experience. Ride side by side beside a high country lake and across open meadows, crest high lookout ridges and enjoy the peaceful solitude. Stop under the tall shady pines and listen to the crackling campfire become a blaze, as the steaks begin to sizzle and the smell of homemade baked beans mingles with the wood smoke for your traditional cowboy feast. Mount up for the return loop back to the ranch and take one final look out at the breathtaking view of the Rocky Mountains. Overnight at Waterton Lakes Lodge. Please plan for five hours of driving to Calgary where your vacation ends with the return of your rental vehicle.